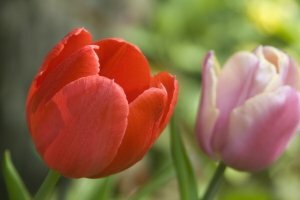 Tulips, along with Daffodils, are bulbs that bring us a fresh burst of color after a long, dreary winter. They look best when planted en masse- or in clusters for the best effect. Planted singly or in rows their colors can get lost, even in the dreary spring landscape. Every color under the rainbow is available for your garden design. Some folks like to plant in blocks of color while others will mix complementary colors- the choice is yours. The many different varieties also vary in height and bloom time, careful selection of these criteria will give you an extended bloom season. Like most bulbs, they like well-drained soil with lots of organic matter. When preparing the bed for your bulbs incorporate compost or peat moss to help with their growth. Our choice would be compost because peat moss adds little or no nutrients to the soil. The organic material makes the soil easier to work and allows for easier removal of the bulbs. Smaller bulbs can be layered over larger bulbs for a dramatic effect. Using earlier blooming varieties such as crocuses will give your beds an extended season of color. The best time for planting bulbs in the Midwest is October and November, when the leaves start changing colors. Northern states can move this up to September and southern areas should wait until November and December. When planting bulbs, size matters. The best bulbs are graded to be at least 12cm in circumference which equates to 1 ½ inches (3.8 cm) in diameter. The bulbs should be free of mold, firm, and undamaged. Slight damage or mold spots can generally be tolerated, but toss any that have large damaged areas. Planting bulbs is a pretty easy process. Plant them at a depth that is 2-3 times their diameter and keep the pointy end up. Even if the bulbs tip over, don't worry. Bulbs know which way is up due to gravity; a property that plants employ called "geotropism." There are several methods of planting beds of bulbs. If you dig your bed to the proper depth and remove the soil, you can lay out the bulbs in your design. You can incorporate compost or fertilizer when planting by adding it to the bed before digging. Once you have the bulbs laid out carefully replace the soil and you can sit back and wait for the spring display. For smaller plantings, the bulbs can be planted individually using a trowel, bulb planting tool, or auger. There is some debate over whether or not bulbs should be fertilized when planted. If you are starting a new bed, we recommend that you do so. Use a fertilizer that is balanced for bulbs. The commercially available products general have an N-P-K ratio of roughly 1-4-4, but any combination where the potash and potassium are higher than the nitrogen number will work fine. Organic or inorganic fertilizers will work just as well, the preference is yours. Bone meal has the proper balance needed, but we've had problems in the past with critters digging up the bulbs when we've used bone meal. No matter how well you care for them, some tulips will only bloom for a season or two at most. Tulip bulbs are produced under conditions that are designed to produce the best flowers for the next planting season. The plants are fertilized, dead-headed, harvested, cured, and stored- all at the proper time. These conditions are designed to produce the best bulbs for the next spring and are harder to replicate in the home garden than under commercial production conditions.